Peas please!, originally uploaded by Venus In Furs. Gibson is really learning to communicate. He's still not speaking so much, but that doesn't stop him from clearly letting us know what he wants. Yesterday he brought a book over to me that has a photo of peas (to illustrate the color green). When I began reading he waited for me to get to the photo of the peas and then he started to sign 'more' and 'eat'. So I went and made him some peas. And it's not a one off trick, he did the same thing again this morning. 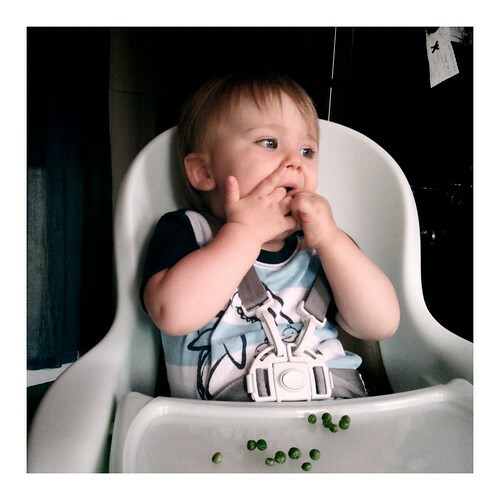 He sure does love his peas! It makes me want to make flash cards of the other foods he regularly eats (or learn the signs for all of them). isn't communicating great?! i hope he's super proud of himself that he told you what he wanted and you gave it to him - that's a huge accomplishment (it also makes me laugh to think that the babies probably think WE'RE finally catching up with THEM)! he'll be talking before you know it!